Our chrome register covers have a solid brass core. These Hamilton Sinkler decorative wall vents are then plated with a stylish chrome finish. Each chrome register cover is made with an adjustable, metal damper. Control your hot or cold airflow in any space easily. Simply designed decorative wall vents have a classy diamond pattern that will look great in your home or office. This chrome register cover is made to be used in your wall and should be ordered according to the wall opening measurement. There are decorative wall vents available in 9 sizes and each will come with their own screws. 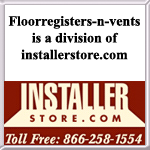 Please note the measurements of all the 2" vent dampers will actually be 2 1/8" to follow industry standards. Note: These decorative wall vents will ship 10 to 12 weeks once an order is placed and processed. Tip: When ordering the chrome register cover, it is important to measure only the size of the opening in the wall. The 4 x 12 decorative wall vents will fit a wall opening of 4 x 12 inches. Each chrome register cover has 1 1/2 inches added to the face plate for mounting purposes. Choose the right decorative wall vents for your home and style by viewing our extensive online selection. Also available areHamilton Sinkler chrome register covers for your floors in this Strathmore pattern. Order these decorative wall vents for your home or office today. You'll love the character they bring to your space.